Picked up at the 2016 Bookcrossing Unconvention held in Birmingham. This is the 19th in the Elm Creek Quilts series, and this time is set in the US during prohibition. This is told from the standpoint of Rosa, and shifts across several timeframes – her early life as she grew up with her childhood friend Lars, marrying John who claimed to love her (even though he suspected the first daughter was not his), and having 8 children between the two men. Finally John’s abusive behaviour is too much for her to bear, and she escapes, taking a load of money from the barn (gained as a result of John’s bootlegging). Lars, Rosa and the remaining children escape to the city, where they find out why some of the children get sick and the others (it’s coelic disease). They then set up new lives – under new names – and start again as if Lars and Rosa had married in the first place. The threat to their new life comes from the prohibition agents who come around the vineyards they now work in. Whilst this is classed as an “Elm Creek Quilt” book, but there’s very little mention of the “previous heirloom quilts” mentioned in the blurb, and only the occasional reference to Rosa making her own quilts. There’s no tie into Elm Creek at all so I struggled to work out the connection. Rosa has a certain amount of strength, as shown in standing up to the Prohibition agent, but whilst John was being violent towards her, she still went ahead and got pregnant by Lars (so she has no issue with committing adultery). The potential threat from John is removed quite quickly, and Lars seems to have no problems with disappearing “off grid” from his family, never to be heard from again – the similarity in his looks to the Prohibition agent only proves to be useful in the end, and there seems to be no issue in deceiving people. Overall, this wasn’t my favourite in the series and it left me feeling rather disappointed. Another season of Elm Creek Quilt Camp has come to a close, and Bonnie Markham faces a bleak and lonely winter ahead, with her quilt shop out of business and her divorce looming. A welcome escape comes when Claire, a beloved college friend, unexpectedly invites her to Maui to help launch an exciting new business: a quilter’s retreat set at a bed and breakfast amid the vibrant colours and balmy breezes of the Hawaiian Islands. Soon Bonnie finds herself looking out on sparkling waters and banyan trees, planning quilting courses, and learning the history and intricacies of Hawaiian quilting, all the while helping Claire run the inn. 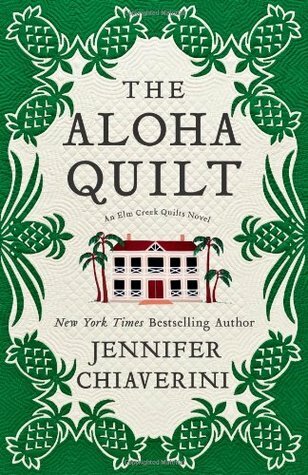 This is practically a stand alone novel in the series, and concentrates on Bonnie, one of the original members of Elm Creek, travelling to Hawaii to help her friend Claire establish a new quilting retreat, whilst putting some distance between herself and her husband during a rather acrimonious divorce. 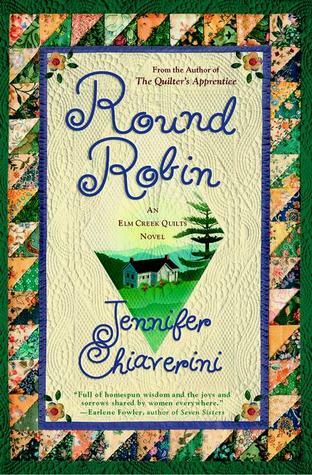 The new setting allows Chiaverini to introduce her readers to a new way of quilting – this is number 16 in the series after all! – as well as giving a potted history of Hawaiian history (no idea if it’s right or wrong but fair dues to her for even trying!). The Elm Creek Quilters are barely seen until the end, for various reasons, so is pretty much a standalone book. The divorce has been a long time coming, so it’s a relief that it’s finally over, even if it’s a small part of the back story. Claire is the opposite of Bonnie – the former ignoring the things she sees as negative, where as Bonnie takes everything the wrong way and thinks it’s for the worst. I have to admit I did skim the occasional small set of pages in this book – there were parts that it did seem to be more of what us Brits call “a party political broadcast on behalf of…” so it ran very close to being a lecture on how bad things had gone for the Hawaiians over the years. This ninth Elm Creek Quilts novel continues the series with a tribute to matriarch Sylvia Compson, who surprised her fellow quilters by marrying her longtime sweetheart on a recent holiday. Eager to honor their favorite Master Quilter, the Elm Creek Quilters hasten to stitch a bridal quilt for the newlyweds. Until the time comes to unveil the surprise gift, Sylvia will be the one in the dark. After two books focusing almost exclusively on Sylvia, this book turns back to the other Elm Creek Quilts members, with a chapter dedicated to individual members. Covering roughly the same period of time, we get to see how the start of the new season affects each person. Sylvia and Andrew are now married, but without a wedding quilt, so the group band together to make one for them in secret. Bonny, whose husband almost had an affair 5 years previously, finds out that her marriage – and the quilt shop – is coming to an end. Mary Beth, the “arch nemesis” president of the Waterford Quilting Guild – and Diane’s next door neighbour has some shocking home truths to learn about her children and the Guild. Summer moves in with her boyfriend, and confronts the fact that she is stagnating in Waterford, in no small part because her mother has manipulated her to remain. It’s good to see the author changes her writing style enough to keep things interesting for the reader and moving along. It will be good to see new characters come in (and possibly some of the other characters leave or fade into the background). 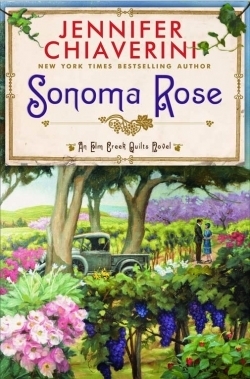 Resolving to locate her mother’s heirloom quilts after so many years, Sylvia Compson embarks on a cross-country investigation of antique shops, quilt museums, and other, more unexpected places, where offers of assistance are not always what they seem. And as Sylvia recovers some of the missing quilts and accepts others as lost forever, she reflects on the woman her mother was and mourns the woman she never knew. Following on shortly after book #4 (The Runaway Quilt), this continues to focus on Sylvia and her investigating her family’s past. Sylvia and Andrew are now engaged, and Sylvia is shocked and disappointed to find that her estranged sister sold off all their mother’s quilts before she died. In a desire to have her mother’s wedding quilt for when she and Andrew get married, she starts searching for them to mixed success. The book interweaves chapters between Sylvia and her mother, a supposedly sickly woman who elopes with one of the Bergstrom men. Once again this book combines a lot about Quilt history and the difficulty attributing quilts to specific people (especially when the pattern has been published in a magazine and the quilter doesn’t name and date the quilt). Family relations continue to run through the book, especially of those between mothers and daughters. Some threads are left open for the subsequent books. One thing that I wasnt convinced by was Andrew’s children’s objections to the marriage – Amy in particular seemed to object to it over much on what seems to be a fairly flimsy excuse – Sylvia being 7 years older than their father and already having had a serious illness, they object cos they dont “want her to be a burden when she gets sick again”. Gerda Bergstrom. Gerda’s memoir chronicles the founding of Elm Creek Manor and the tumultuous years when Hans, Anneke, and Gerda Bergstrom sheltered fugitive slaves within its walls, using quilts as a signal of sanctuary. But little did the staunchly abolitionist Gerda know that a traitor was among them, placing the Bergstroms in grave danger and leading to family discord, betrayal, and a secret held for generations. 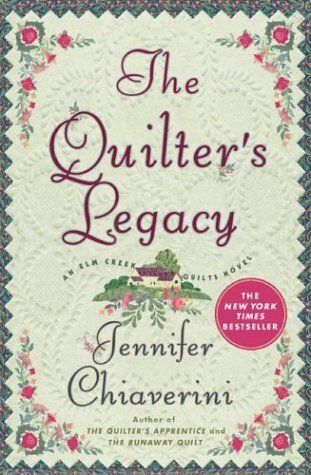 With the help of the Elm Creek Quilters and clues hidden within antique quilts discovered in the manor’s attic, Sylvia stitches together the pieces of her past and decodes the true nature of the Bergstrom legacy. Number 4 in the series and the Elm Creek Quilters is up and running as a business. This book focuses on Sylvia, who finds a diary written just before the Civil War, along with several old and partially damaged quilts. It is written by Gerda, who came over from Germany with her brother to found the house and business that Sylvia and her siblings inherited. 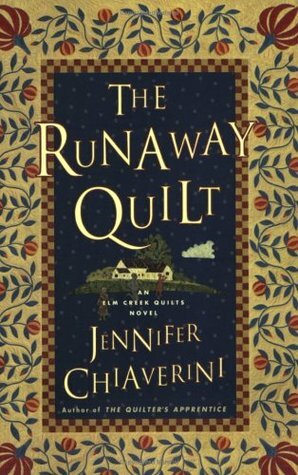 The Runaway Quilt takes us through Sylvia reading through this journal and finding out things about her family and the community she joined during a very difficult period in American history. The book does deal with escaped slaves on the road away from the southern states, but avoids the more brutal facts of the business, rather addressing it from a rather genteel 21st century viewpoint reading a 19th century gentle-woman’s diary. I put “Beloved” by Toni Morrison on the back burner whilst reading this book, so it’s interesting to see the two different approaches to writing about the same time from two different perspectives. The Elm Creek Quilters have begun a round robin…a quilt created by sewing concentric patchwork to a central block as it is passed around a circle of friends. Led by Sarah McClure, who came to Waterford, Pennsylvania, with her husband, Matt, a few years ago, the project is to be their gift to their beloved fellow quilter Sylvia Compson. But like the most delicate cross-stitch, their lives are held together by the most tenuous threads of happiness…and they can unravel. 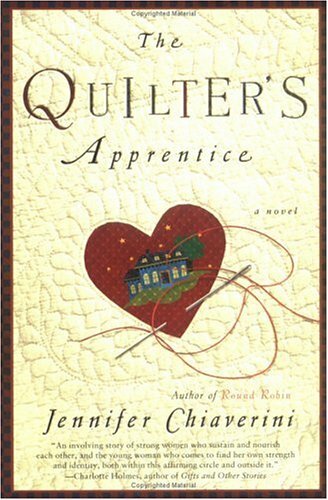 Second in the Elm Quilters series and set 2 years after The Quilters Apprentice. The Quilt camp started at the end of The Quilter’s Apprentice is up and running, and the group members all help out and give classes. Each chapter gives focus on a different member of the group and the problems they have as they aim to make a round robin quilt for Sylvia . Bonnie finds her husband is about to meet a woman he knows from the internet in order to have an affair. Diane is having trouble with a neighbour when she builds a skateboard ramp in her back yard. Sylvia’s friend Andrew returns after a 50 year absence. Sarah’s relationship with her mother hasn’t gotten any better after the constant criticism directed towards her. The book is short (approx 300 pages in paperback), and with only a chapter per person, the resolution of each problem can therefore seem trite and a little forced. Some people find Sarah an immature woman unwilling to move on, but they are clearly people who have not suffered from someone continually criticising everything they do. When Sarah McClure and her husband, Matt, move to the small town of Waterford, Pennsylvania, to get a fresh start, Sarah struggles to find a fulfilling job. Disheartened by failed interviews, she reluctantly accepts a temporary position at Elm Creek Manor helping seventy-five-year-old Sylvia Compson prepare her family estate for sale after the recent death of Sylvia’s estranged sister. As part of her compensation, Sarah is taught how to quilt by this reclusive, cantankerous master quilter. During their lessons, Mrs. Compson slowly opens up to Sarah, sharing powerful, devastating stories of her life as a young woman on the World War II home front. Hearing tales of how Mrs. Compson’s family was torn apart by tragedy, jealousy, and betrayal, Sarah is forced to confront uncomfortable truths about her own family — truths that she has denied for far too long. As the friendship between the two women deepens, Mrs. Compson confides that although she would love to remain at her beloved family estate, Elm Creek Manor exists as a constant, unbearable reminder of her role in her family’s misfortune. For Sarah, there can be no greater reward than teaching Mrs. Compson to forgive herself for her past mistakes, restoring life and joy to her cherished home. Given to me as a late Christmas present, this is the first of the “Elm Creek” series. Slowly but surely it tells the story of the recently married Sarah, who has moved to near Elm Creek with her husband and whilst looking for a new job, helps the owner of Elm Creek to clear the place to make it ready for sale. Sarah manages to chip away Sylvia’s secret life, whilst learning how to quilt and introduce both of them into the local community. Their relationship allows them to confront the troubles in the here and now whilst making for some forgiveness of the troubles in the past. It’s a slowish moving book but still one that can be read in a matter of days. There’s a certain gentility of Sylvia’s life, despite the pain and loss she has had in her life. Meanwhile we get some hint as to what has gone on in Sarah’s life too that has brought her and her husband to this place.